Please see the attached media release for details on how the Disabilities and Human Rights group will be celebrating the International Day of Persons with Disabilities and wrap up their Stories of Dignity and Respect campaign . A New Year begins for the Festival of Neighbourhooods. We are already collecting registrations gearing up for the first Early Bird Draw for all the activities you hosted by December 31st. Halloween and the Holiday season offers many opportunities for neighbours to get together indoors and outdoors! Read our November newsletter and tell us more about the great neighbourhood of yours. The Social Planning Council of Kitchener-Waterloo is seeking an experienced, energetic and highly organized person to ensure efficient operation of our organization, projects and programs by overseeing and coordinating all office resources and record keeping, facilitating team communication and ensuring projects activities are supported and on track. See the attached job posting for more details on the position and how to apply. While the 2014 budgets are being planned, Poverty Free Kitchener-Waterloo Action Group is joining many provincial networks and some municipal governments, including Region of Waterloo, in asking that the last year's 42 million in transitional funding becomes permanent support to housing and homelessness-related programs. Read the Poverty Free Kitchener-Waterloo letter of support here. You can join this demand by forwarding the attached letter to the Provincial and Municipal Governments. The elevator in our building at 151 Frederick Street will be out of service from November 18th to November 29th, with elevator service resuming on December 2, 2013. The 3rd floor Resource Centre will be open Monday to Friday, 9am to 5pm but, unfortunately, the only access will be by the stairs. Dignity and Respect- Share Your stories! The Disabilities and Human Rights Group invites you to mark the United Nations International Day of Persons with Disabilities on December 3, 2013. This year's theme is "Break barriers, open doors: for an inclusive society for all." Participate in this exciting initiative! Share your personal experiences to encourage the broader community to participate. 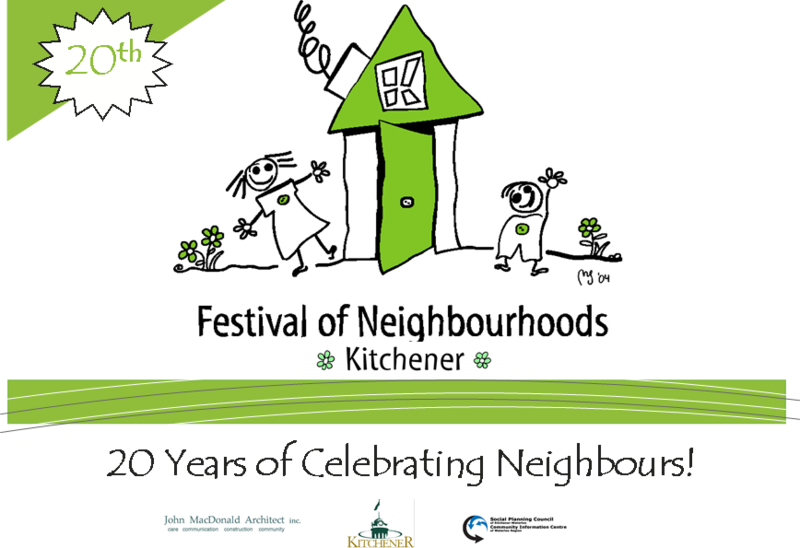 "The Festival of Neighbourhoods is really about providing resources, encouragement and recognition to Kitchener citizens for taking the small step to bring their neighbours together," said Janice Ouellete, the co-organizer of the 20th Festival Finale and the facilitator of volunteer resources fot the City of Kitchener. All our volunteers did the wonderful job co-hosting a historic celebration and helped in making all our award winners shine. The Festival received an award itself from Catherine Fife, MPP Kitchener-Waterloo! Below we present to you all the 20th Finale Winners and you can read more in this weeks edition of Kitchener Citizen! 20 Years of Celebrating Neighbours! Everyone is welcome to the Finale and to join in with the celebration of our neighbourhoods! Regarding the multiple but connected consultations on poverty reduction, Poverty Free Kitchener-Waterloo raises the importance of integrated systems and different Ministries working together. Equally, there are more meaningful and more accessible ways the government can work on poverty reduction with local partners across the province. 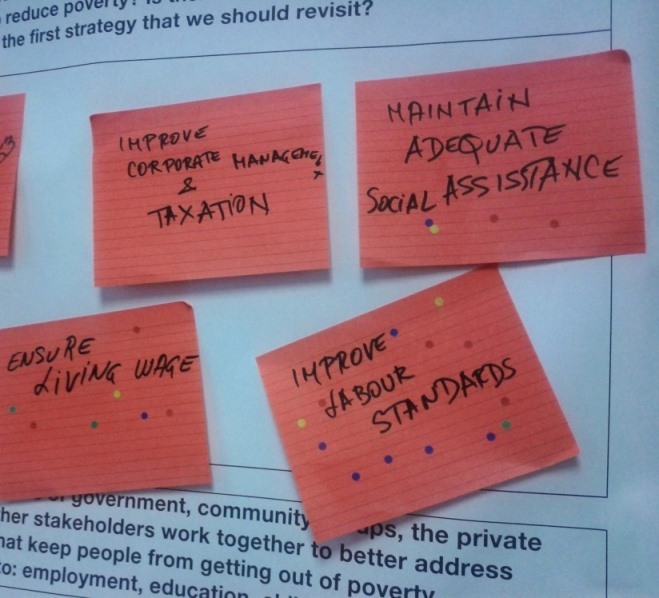 At today's Poverty Reduction Consultations in Kitchener, the community was determined to broaden the focus of the strategy in Ontario: Increase Social Assistance Supports, Increase Labour Standards and Minimum Wage, Invest and Lift everyone out of poverty. The regional priorities remain housing and health. The Minister of Community and Social Services, Ted McMeekin said: "No one is guilty for needing assistance and we are all responsible for finding solutions". Read the consultation submission from the Poverty Free Kitchener-Waterloo Action Group and see the faces and the voices from the Waterloo Region participants on our facebook album.